Are you lying outside on a hot sunny day adn wondering to yourself “My Oh My, it feels so good!”? Sitting out in the sun can make it seem like every ache and back pain you had was never there to start. Do you ever wonder why that is? Simply, It’s becuase the wonderful and sensational rays of the sunshine are heating your body up from the inside out. As you continue to sit for about an hour or so, you’ll get this very energized yet relaxed feeling as your body is absorbing the natural heat of the sun. To understand why the suns heat calms you and gives you a soothing effect, we have to look at their rays. The sun has many different types of rays it emits but the one we want to focus or full attention for deep penetrating pain relief are called Infared waves. Unlike the UVA, UVB, and UVC rays you so much hear your health professionals carefully explaining to you about causing nasty sunburns and can be linked to cancer, far infared waves are completely safe. The best part about getting Far infared waves into your body is that it goes deeper than the other ones listed just above, and works the best at relieving you of your aches and pains. While it’d be nice to spend the remaining of this article talking to you about beach destinations, sitting out in the sun with your pink lemomdae, that’s not what this article is going to be about. What I want to tell you will go much deeper, I want to tell you all about the health benefits of a far infared heating pad for a bad back, and how you 110% harness FIR right from the comfort of your own home, rain or shine, 24 hours a day, when you wake up, till the moment you have to sleep. So let’s jump on in shall we? Why Are Far Infared Heat Waves Different Than Any Other Wave? You’ve likely picked out a bottle of sun lotion from your local retailer, but if you haven’t the sun can make up for that…in a suns rays you have UVA, UVB, and UVC rays that are weak penetrating and damagin agents that only have a negative twist for your skin and body. And unlike these rays, far infared is super safe, and invisible forms of heat that operate on the opposite end of the spectrum. Most light and heat waves are ambient, meaning that they work to heat up the air around you not in you, not even penetrating through your skin for a mere ounce. Or they can burn you skin as you try to get warmer by direct contact. The waves of far infared heat are way different. It has a longer wavelength that can epentrate as much as 1.5 inches deep through your thick tissue, warming your from the inside out. In a matter of minutes your pain is swept away. What Are The Other Health Benefits Of Far Infared Heat Therapy? 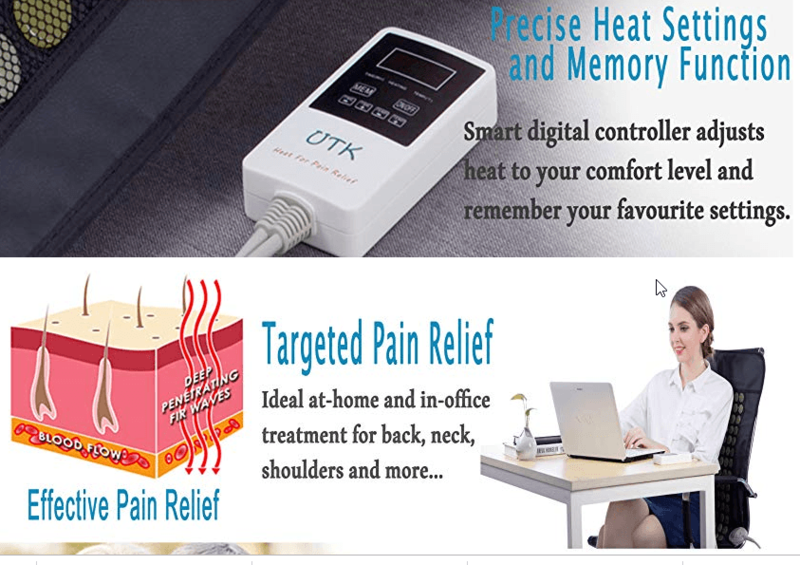 How To Choose The Best Far Infared Heating Pad For You? Far infared heat waves fall on the elctromagentic heat spectrum as an “ion”.That means these waves are converting molecules or atoms into ions. The process on a chemistry level is that the particles in the infared heat are losing an electron, this becoming ionized. This also means that these haves waves can be converted positivelty into charged particles, communicating with pain, neutralizing it, or in turn becoming a negative ion. Far Infared heat will transform the pain in your back so that your body will not feel it. When you flip on the far infared heat switch, your blood vessels and cappaliires begin to expand. And the blood that was standstill begins to move freely and smoothly once again. At this point crucual oxygen and nutrtients are delivered widely throughout your body, and also reaches the region of your pain to wipe away any unesseary inflammation. …Begin to fade away. You’ll notice how your back will become more flexible, and you’ll be able to bend it forward, backwards, and twist musch easier without pain. And its at this point that stretching will be the best next thing to focus on. Even Helps you lose weight! Mainstram Medicine is Failing You…. If you’ve paid a visit to your doctor for chronic lower back pain, its likely that you’ve been adminstered a prescription drug, or sent to physcial therapy, or even so told to take over the counter NSAIDs. And if you’ve been on these “plans”, you know that finding real pain relief is hard to come by. Most of these remedies don’t work. And the pain pills that feel like they are working are never a long term solution. Guess what? We’re made to believe that a chronic back or sciatica that is connected to arthrtis and aging is impossible to cure. So rather than focusing on fixing the root of the cause, you’ll see doctors just focusing on managing your pain. The problem with this approach is that it will neve rrestore motion and strngth in your body. And even scarier is that it doesn’t preent other potential diagnosis from attaching to your body. When you keep taking pain medications, you’ll contiune to have pain no matter if you’re exercising, trying to eat better, and work on your mind, its just proven. I’ve abondened the process of Big PHARMA, and moved to a more natural remedy state. It would be nice if we could just sit out on warm sunny day in the middle of our favorite beach, but that’s not the case. Unless you’re living in California, Texas or Florida, or a country near the equator like costa rica, its highley unlikely that the suns rays will be powerful enoug most times of teh year. And even if you do subside ina warm climate region, the stormy clouds and rain are never too far away. In the past, hospitals used to have hospital-grade light therapy equipment. These are esxpensive, going over the $5,000 mark. Hey, its cool, but its most out of rach for people like you and I.
Thankfully there is a much better solution that won’t break the bank, and will STILL deliver the same heating therapy and pain relief, a far infared heating pad. You can get the same feel of the suns heat if you were using an infared heating pad. If there is a storm, or a blizzard outside, you can harness the suns rays through an infar heat pad just the same. The best infared heating pads actually carry a material that is known to produce neagitvely charged ions when heated.That’s why one of the best materials for that are jade stones. 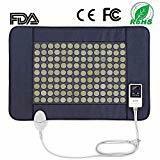 So using a heating pad that comes with the same material used for jade stones to transfer thermal enerfy will not only adress your lower back pain, it will also address many of the underlying issues of that pain. I like this one because it comes with every point I touched on just above in the bullets. The reason that I like this one so much over any others it has a fully body coverage which ensure that I can cover my lower, mid and even upper back all at once all while getting the maximum amount of heat to my targeted area of pain. Also, the precise heat setting and memory function make it easy to use anywhere at any time. Now, everyone will have a preference, and if you’re anything like me, I look for the BEST deal. But sometimes you have to look beyond the cost and look more for quality, not quantity.